A Dynamometer (Dyno) is a device that measures rear wheel horsepower, torque, AFR (Air Fuel Ratio), tuning temps etc. under controlled conditions. It allows us to tune the bike whilst replicating real road conditions. When we dyno tune the bike we remap the computer (ECM or ECU) to deliver the correct fuel and timing for optimal performance under all loads and throttle positions. Front and rear cylinders are mapped independently to compensate for manufacturing tolerances, exhaust design, inlet tracts and operating temperatures. The result is an engine that will wear less, run cooler and smoother, and produce more power and economy. The Harley fuel injection system is designed to run the bike at an air fuel ratio of 14.7 to 1. The main reason for this is to meet the tough emission laws. Unfortunately this results in a hotter running engine that produces less power and is prone to pinging. The fact that an air cooled v twin motor can meet these standards is a credit to the company. When we modify our bikes with free flowing exhausts and air cleaners we make more air available to the engine but it is still delivering the stock amount of fuel. This makes the engine run even leaner. Lean is the condition when there is not enough fuel delivery for the amount of air. Timing is also quite advanced with a stock map to meet emissions and this compounds the problems. A lot of articles state that an air fuel ratio (AFR) of 14.7 (stoichiometric) is ideal, above this is lean and below this is rich. This is true when concentrating on gasoline emissions. However if you had an AFR of 13.5 at wide open throttle it would actually be considered lean. The same AFR of 13.5 under normal cruise conditions would be considered rich! Dyno tuning allows us to set up the optimal AFR for the engine configuration and load. Do you want more horses? The Ultimate bolt on, performance upgrade for your Harley-Davidson® 96ci or 103ci engine. This kit will provide great, reliable torque & horse-power through the rev range. The Stage 6 Power Kit includes the revolutionary S&S Easy Start Cams, making your high performance engine a breeze to start. The S&S cams are built for power, with an irn pressive 0.635″ lift. The S&S Super Stock heads supplied are intended for larger displacement, high horsepower engines. The Heads include high lift valve springs & oversize valves. 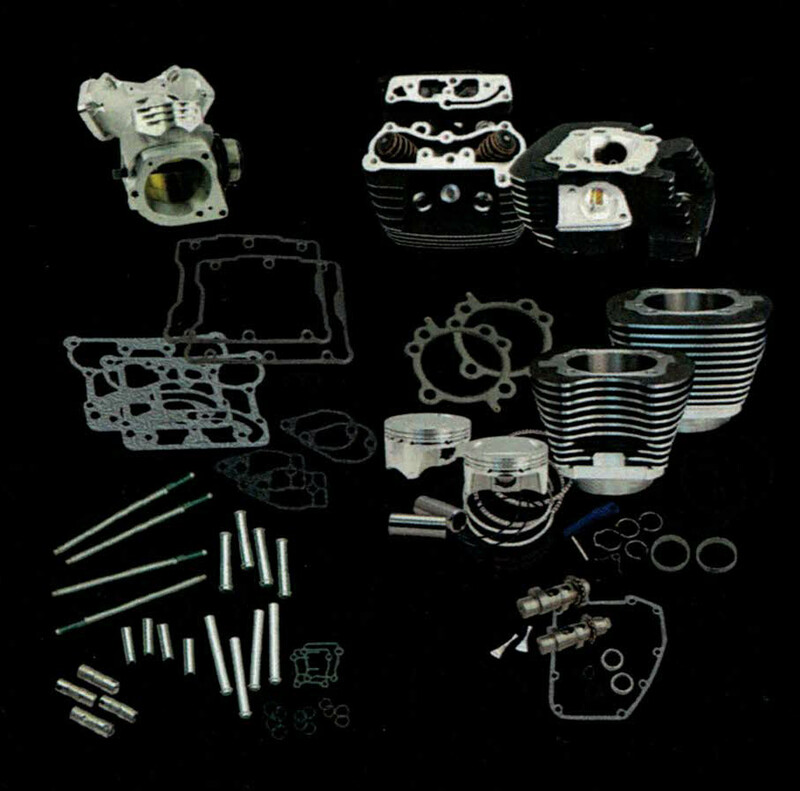 The S&S Big Bore cylinder kit is direct bolt-on, Proven Performance with Proven Technology.